We’d love your help. 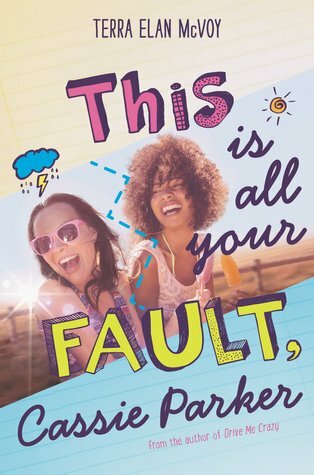 Let us know what’s wrong with this preview of This Is All Your Fault, Cassie Parker by Terra Elan McVoy. In this heartwarming companion to Drive Me Crazy, twelve-year-old Fiona Coppleton is living a middle schooler’s worst nightmare: her diary was made public and her best friend is partly to blame. Fiona and Cassie are supposed to be best friends forever. No one else listens or makes Fiona laugh like Cassie, and that meant everything when Fiona’s parents were divorcing. They l In this heartwarming companion to Drive Me Crazy, twelve-year-old Fiona Coppleton is living a middle schooler’s worst nightmare: her diary was made public and her best friend is partly to blame. To ask other readers questions about This Is All Your Fault, Cassie Parker, please sign up. Do you need to read "Drive Me Crazy" first in order to enjoy "This Is All Your Fault, Cassie Parker"? This Is All Your Fault, Cassie Parker by Terra Elan McVoy is hands down one of the best middle grade reads I have come across. I absolutely loved this story! It spoke volumes. It reminded me of what a minefield of emotions one experiences in those tender years between elementary school and high school. It also reminded me of the importance of staying true to self no matter what. Cassie and Fiona were best friends. They had a history rich with good times, but th This Is All Your Fault, Cassie Parker by Terra Elan McVoy is hands down one of the best middle grade reads I have come across. I absolutely loved this story! It spoke volumes. It reminded me of what a minefield of emotions one experiences in those tender years between elementary school and high school. It also reminded me of the importance of staying true to self no matter what. Cassie and Fiona were best friends. They had a history rich with good times, but things were changing. Fiona: This young lady really impressed me. I liked her so much. She had a strength about her. I loved that she was constantly making observations, examining and assessing the world around her. She was so mindful of dynamics. I could see her stretching and growing before my eyes, and I was excited to see who she was going to become. Cassie: Where do I begin? Cassie was a mixed bag of tricks. Her Cracker Jack interior was a big, fat question mark. It was like her wheels were always turning toward what she could do to climb up into the "Now that's hot crowd." I so wanted to like her as much as I did Fiona, but I just didn't. I stayed hopeful about her since Fiona saw something in her that was beautiful. Fiona: One thing I can say about Fiona is that she was a fireball. Even though she was in battle-survivor mode, she remained consistent. I loved her fierceness. I know that's a strange word to use to describe her, but it goes back to that strength I mentioned before. This youngling was a lioness in the making. It was pure joy for me to see this character's metamorphosis. She was devoted, vocal (and learning to be more so with each passing moment), and wonderfully unique. The things she had to deal with, from the time of the great conflict on, were huge. That she was maneuvering and finding her way through it all without losing it made me love her even more. Cassie: What gives, dude?!?! Gah... I know that you are more than what you appear. These were my thoughts regarding Cassie after the great conflict. I want, actually no, I NEED, to say more about dear, forlorn Cassie, but I don't want to give anything away. All I'll say, at this point, is that the outside looking in and the inside looking out will always be vastly different. There was a fantastic lesson in her story at this stage. Fiona: In a nutshell, Fiona dazzled me. I will forever remember this character. She certainly made a lasting impression on me. Cassie: There's hope for you yet, I believe. I can honestly say that I was proud of her. Supporting Characters: This story came with such a wonderful range of colorful personalities. I adored the Yoda-like wisdom and stances of three characters in Fiona's life, in particular. Evie charmed me also. She had a lesser role that was more on the scale of kindred spirits, but there was definitely something about her. The villains, of course, stayed their nice-nasty selves, but I was convinced that there was more to their own stories. Queen Kendra piqued my interest more and more, to the point that I wanted to view this story from her perspective. I also felt drawn to Pencil, if you can believe it. Ha! Who knew? The conclusion of this incredible MGR brought to mind new hopes and genesis moments. And you know what, no matter what age any one of us is, we each need those two things. McVoy's writing, in general, is insanely good. Her works are so textured. I have read several of her books, and what I can unwaveringly say is that each one packs a punch. Her ability to give her characters such wonderful depth, such distinctive voices, and such unique experiences and life lessons only makes me want more. Her middle grade readers (MGR) - Drive Me Crazy and This Is All Your Fault, Cassie Parker - knocked me backwards and brought me forward in the best way. I was floored by how easily I got caught up or rather emotionally vested. I laughed, I bit my nails, and I even teared up a few times with these young ladies. I love when books touch me like that. The one thing I want to say that I appreciate the most about McVoy's writing is her dedication to follow the thread. What I mean is that I love how she presents a literary fabric and then follows each particular character thread. She remains consistent with this. Not all authors are able to do this. This word wizard was a genius, in my estimation. She took one great conflict and masterfully wrote two different books, offering two distinct points of view. There was and is, of course, more to it, but...wow. Brava! Bravo! Brilliant! Keep it coming. "This Is All Your Fault, Cassie Parker" was a solid enough book that had a fantastic start but a shaky end. Fiona Coppleton is fortunate. She has a best friend, great (but divorced) parents, and an over-all happy and blessed life. UN-fortunately, though, her perfect little utopia is blasted to pieces when Doomsday comes. Okay, not the ACTUAL end of the world. More like what most likely SEEMS like the end of the world to a seventh-grader. So, anyways, what happens is that Fiona's private diary ge "This Is All Your Fault, Cassie Parker" was a solid enough book that had a fantastic start but a shaky end. Okay, not the ACTUAL end of the world. More like what most likely SEEMS like the end of the world to a seventh-grader. So, anyways, what happens is that Fiona's private diary gets stolen and read aloud on the bus. *cringe* If I was in Fiona's place, I would be mortified too. But that isn't the worst of it. The worst is when Cassie starts to flake out on Fiona. It's not a all-at-once breakup- and that's part of what makes it hard for Fiona. Fiona is hurt beyond words when Cassie badmouths Fiona and her friends. ( friendS? Girl, you are so lucky to have not just a friend, but multiple ones.) Will Fiona be able to heal, or will the scars of Cassie haunt her forever? I didn't realize until The Writer's Camp that Fiona was black. There was that little description and detail. I honestly don't see how the cover connects to the characters at all. With this and the author being white, I'm not classifying it as a diverse read. This feels just like every other status quo book. A throwaway line isn't enough to differentiate. I haven't read Drive Me Crazy before reading this and I don't plan on it. It seems like this book would come first and Drive Me Crazy would com I didn't realize until The Writer's Camp that Fiona was black. There was that little description and detail. I honestly don't see how the cover connects to the characters at all. With this and the author being white, I'm not classifying it as a diverse read. This feels just like every other status quo book. A throwaway line isn't enough to differentiate. I haven't read Drive Me Crazy before reading this and I don't plan on it. It seems like this book would come first and Drive Me Crazy would come next to explain Cassie's weird behavior at the end. It doesn't feel resolved or had closure at all. >>Fiona has a supportive family and they're well off. I agree with her friends, it must be nice being rich. They have their own nanny/housekeeper, and go out all the time. >>Liked how mature and well the parents are handling the divorce and co-parenting. I enjoyed this book. It was a fast and fun read. This is a story of two girls who are best friends until something happens to one of them, that's when their friendship gets tasted. This a story of growing up and figuring out how friendships change and grew us they do. A perfectly relatable growing up book. It almost felt like reading a diary from my junior high self! In this companion to Drive Me Crazy, we meet Fiona, whose best friend Cassie does not stop a popular from reading Fiona's diary, and the two fall out because of it. Cassie is mad that Fiona wrote things about her, and Fiona feels that her privacy was invaded. Cassie then takes off on her adventure in Drive Me Crazy, and Fiona is faced with a summer alone. Since her parents are divorced, Fiona has struggled. Her younger sister Leelu is perfectly happy to hang out with her father and his girlfriend, Jennifer, but Fiona is alarmed by the thought of "losing" not only her father, but also her sister, to Jennifer. Tired of the school drama as well as her family drama, Fiona decides that instead of a family trip to Disneyland, she would rather go to a writing workshop. There, she meets others who share her quirkiness, love of writing, and dislike of friend drama, and makes her peace with having lost Cassie as her best friend. Strengths: I liked that this was a problem novel that addressed problems that many of my students ACTUALLY have. Rather than dead parents or dying siblings, it covers families that split apart but are supportive, friends who make bad decisions that negatively affect other friends, and a student who has a particular interest that she wishes to explore. Weaknesses: I understand why writers want to create characters who also like to write, but there are a lot of those. I'd rather characters who are interested in a sport, or recycling, or helping at a pet shelter. I also found it a tiny bit hard to believe that Fiona would be foolish enough to bring her journal to school. I kept journals all through school and knew enough to lock those babies up tight! What I really think: I found Fiona to be an annoying character, but I liked the stories about the friend and family drama and think this will circulate well. It's nice that you could read either book first. I really enjoyed this book. A lot more than I thought I would. It has a little bit of everything, especially with the characters, which made it fun to read. Each character had such a personality that was believable and easy to love. I personally would classify this as a diverse book. The diversity might not be as obvious as other diverse books out there. However, the main character Fiona and her sister Leelu are black. And Fiona met a friend with two dads. Then, her mother is a single independent I really enjoyed this book. A lot more than I thought I would. It has a little bit of everything, especially with the characters, which made it fun to read. Each character had such a personality that was believable and easy to love. I personally would classify this as a diverse book. The diversity might not be as obvious as other diverse books out there. However, the main character Fiona and her sister Leelu are black. And Fiona met a friend with two dads. Then, her mother is a single independent black woman (which I admire in books, regardless of color). When I first started reading This Is All Your Fault, Cassie Parker . . . I was afraid it was going to be cheesy and “trashy.” Kind of like the way The Clique series is. You know, a bunch of middle school girls snubbing each other and bringing down their self esteem. Then when Fiona had her diary stolen and read to everyone, I was like “here comes all the drama,” and not in a good way! However, it didn’t go as expected. I’m so thankful for that. Fiona could’ve sought revenge, she could’ve gotten back at the girls who invaded her privacy. There was one incident in the food court, but that was nothing. Fiona was very grown up about the whole thing. While she did wallow and felt sorry for herself, she still decided to make the best of it. Fiona's life seems ruined when her diary is stolen and read aloud on the bus, her best friend ditches her for the popular girls and her father's girlfriend keeps butting in where she's not wanted. It's too much for one girl to take! Luckily, she's a strong young woman and she's got people in her life who can help her navigate the pitfalls of middle school if she'll let them in. This had way more depth than I expected and the diverse characters were a welcome change. I will be adding to my recomm Fiona's life seems ruined when her diary is stolen and read aloud on the bus, her best friend ditches her for the popular girls and her father's girlfriend keeps butting in where she's not wanted. It's too much for one girl to take! Luckily, she's a strong young woman and she's got people in her life who can help her navigate the pitfalls of middle school if she'll let them in. I thoroughly enjoyed being able to read this. Although, there were a few parts that confused me because of how they were worded. But, I always found myself skimming ahead and reading faster to find out what would happen next. I put off quite a bit of work and regret nothing. In this book, you get to follow the life of a soon-to-be-eighth-grader, Fiona. You get to experience what she goes through with Cassie, Kendra and her friends, Tyrick, and even a few new friends a long the way. I would recomm I thoroughly enjoyed being able to read this. Although, there were a few parts that confused me because of how they were worded. But, I always found myself skimming ahead and reading faster to find out what would happen next. I put off quite a bit of work and regret nothing. In this book, you get to follow the life of a soon-to-be-eighth-grader, Fiona. You get to experience what she goes through with Cassie, Kendra and her friends, Tyrick, and even a few new friends a long the way. I would recommend this book if you are unsure about it. A sweet middle school story about friendship, family, and divorce that will be popular with fans of realistic fiction. Received as an ARC at the PLA conference. Great middle school read covering all the "drama" that goes along with divorce, mean girls, siblings, etc.